Content: There are a bunch of f-bombs, some teenage smoking, and some depictions of domestic abuse. It will be in the Teen (grades 9+) section of the bookstore. Vic is many things: a teenage boy, a son whose father has died of cancer, a lover of music and math. He also has Moebius syndrome, but he doesn’t let that define him. No, these days, he lets his dad’s absence and his mom’s new relationship define him. And one night, when things become unbearable, Vic grabs his dad’s ashes and takes off. Out there, he runs into an interesting group of kids, under the protection of a Congolese immigrant named Baz. They fly under the radar, taking people in who need help, give them the help they need, and send them on their way. And Vic most definitely needs help. Especially after he opens his father’s urn and discovers instructions as to where his ashes should be spread. So Vic, with his new-found friends, takes it upon himself to scatter his dad according to his wishes. Things aren’t that simple, though. Vic gets caught up in the lives of what comes to be called Kids of Appetite, and when the uncle of one kid ends up dead (and Baz is a suspect), Vic finds himself in the police station. There’s a lot going on in this novel: there’s a main character with a disability, and some discussion on etiquette when dealing with someone who doesn’t look like you. There’s diversity and refugee and immigration issues with Baz and his younger brother as they try to make a new life for themselves. There’s a semi-traditional love story. There’s a murder. But, even with all these weird eclectic elements, it works. 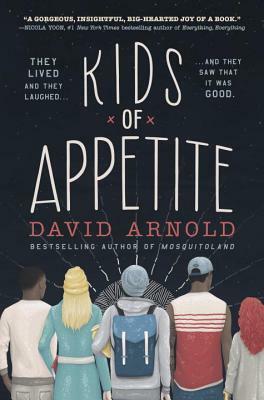 It’s such a character-driven novel and each and every character (well at least with the Kids of Appetite) is a gem. The novel alternates between Vic and Mad, an 18-year-old girl who is kind-of a runaway as well, and each of their voices was delightful. I liked that there was a dark edge to this, that there are things to think about, and yet it’s ultimately a story of hope and redemption.